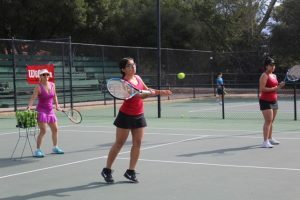 As a lead up to the 118th Ojai Valley Tennis Tournament, known as “The Ojai” scheduled to start April 25-29, the Ojai Valley Tennis Club (OVTC) organized and sponsored a tennis clinic for promising Ojai area youth players last Saturday on all eight courts at Libbey Park. The players were selected by the Ojai Valley Tennis coaches for their ability and enthusiasm for the sport. Some forty young players participated, mostly from the Ojai Valley, with a few Rio Mesa and Santa Barbara stand-outs sprinkled in. 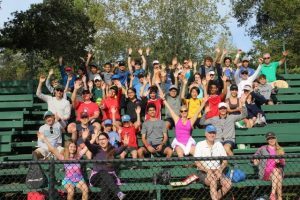 This free event brought some of the most talented and skilled tennis professionals to Libbey Park who donated their time and expertise to demonstrate and encourage technical skills on the court for the local aspiring youth tennis players. Coaches and professionals — Mike Burke, Ron Edwards, Ryan Gaston, Jim Kasser, Scott Burton, Katya Welborn, Stacy Potter and Fabio Lauretta gave three exhausting hours of instruction, rotating the players through a variety of drills. At noon the players and coaches were rewarded with delicious hot pizza, and healthy salad donated by Toppers Pizza Place, along with very tasty Pixies donated by Friends Ranches. In addition to the lunch, the players were surprised with Wilson Sporting Goods donated T-shirts, hats, wristbands, grips and other prizes. After lunch several hard fought matches were played, both singles and doubles, where the young players had the chance to incorporate their newly acquired tennis skills into practice. Both the juniors and coaches are looking forward to The 118th Ojai, in which several of the Clinic participants will compete, or volunteer as ball boys, or in other capacities. For more information on the tournament, or to sign up as a volunteer, please see http://theojai.net or call (805) 646 7241.